Iceland’s weather is, for most people, a love-it or hate-it sort of thing. Cool air, cloudy skies, and damp winds are signatures of this Nordic nation, with a similar climate to Seattle or Ireland. The temperate weather means you’ll never be freezing cold or super hot, but you’ll pretty much always want a sweater on hand. But even if cool weather isn’t your favorite, Iceland is definitely worth a visit. It’s truly one of the most beautiful places in the world. Jagged coastlines and pristine beaches, massive volcanoes, hot springs, mountains, even glaciers and lava fields all make Iceland as unique as it is picturesque. 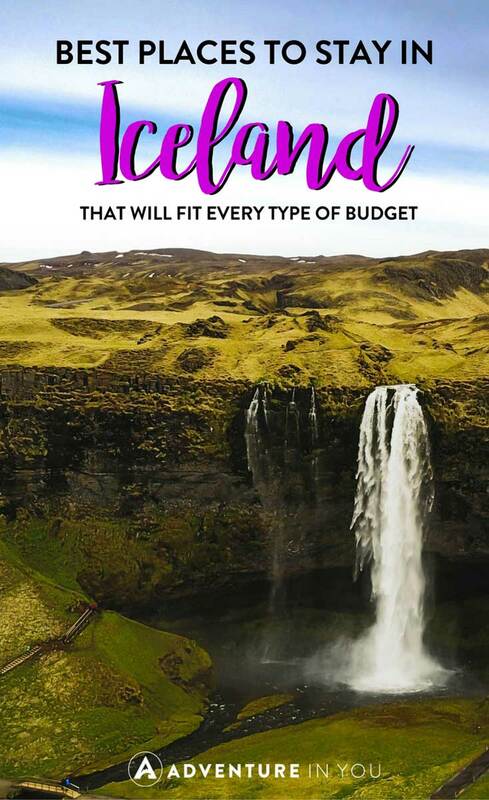 Check out our list of the best places to stay in Iceland on any budget. From discount hostels to luxury hotels, we have something for everyone, no matter when you want to stay in Iceland. The capital city of Reykjavik, located in southwestern Iceland, is the country’s biggest city and a popular tourist destination. (Fun fact: it’s the northernmost capital city in the world!) Set on the edge of Faxa Bay, it has the best of coastal living with all the luxuries of a trendy city. Check out some museums, take in the historic sights, and indulge in some amazing dining and shopping throughout the city. Here are a few recommendations for some of the best places to stay in Reykjavik. A lot of hostels leave something to be desired. You’ll stumble into dingy buildings with questionable beds and start wondering why you didn’t splurge on a private hotel room. But thankfully, that’s not the case here. This hostel is affordable but pretty nice, as far as hostels go. The accommodations are simple but clean and spacious, and the facility is new. There’s even a full kitchen with a dishwasher on hand! These apartments are small but well designed and stylish. The basic studios feature a bed and couch with a small kitchenette area, while the deluxe apartments can fit up to four guests with a combination of beds and pull-out sofas. This is a great place to stay in the heart of the city and is great for longer visits if you’ll want to be cooking for yourself or spending more time indoors. These apartments are new and tastefully decorated, but they’re definitely a little…cozy. If you don’t mind being in close quarters during your stay, this is a great option. Affordable prices and a prime location make it worth the small space. The kitchen area, though compact, is fully stocked and perfect for cooking your own meals. The hotel is within walking distance of plenty of great restaurants and shops if you want to eat out, too. 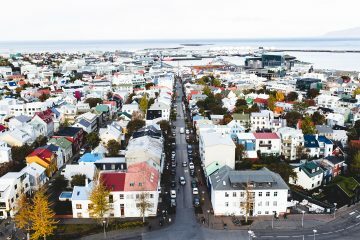 If you’re looking for a more detailed list on the where to stay in Reykjavik, check out our complete guide that has information on the best places to stay that will suit whatever type of travel budget. The southern coast of Iceland is one of the country’s most beautiful areas. Stunning waterfalls, gorgeous shorelines, and massive glaciers highlight the region’s true beauty. A lot more rural than Reykjavik, this area is perfect for those looking to explore some of Iceland’s rugged landscapes. This guesthouse does kind of have the feel of staying in someone’s house. The accommodations are simple but clean and comfortable. There are a backyard and an outdoor seating area, and the host of the house is super helpful and will give you recommendations for local sights. The rooms are well-lit with modern decor, and the guesthouse also has a kitchenette and dining area. While the interiors of this guesthouse are attractive and well designed, the real selling point here is the back deck. If you’re lucky enough to catch some warm weather during your stay, the lounge chairs will offer a chance to soak up some sun. But even if the coldest weather, the spacious built-in hot tub adds an element of luxury to your stay. The guesthouse is within walking distance of several shops and restaurants for added convenience. These apartments are well worth their higher price tag. Easily accommodating up to four or five adults, they are spacious and elegantly decorated. The bedrooms are small but the living areas feature ample sitting spaces where you can take in the scenic views from large front windows. The are lots of local attractions and great dining spots nearby in Selfoss. Farmer’s Guesthouse is an adorable little farmhouse in Hella’s rich countryside. A perfect spot for families or groups, the four-bedroom house can accommodate up to eight people comfortably. Horses, sheep, and cows live on the farm, and the host will let you interact with them if you want. 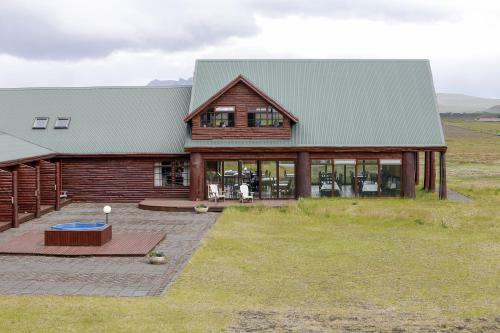 The guesthouse is located close to some of Iceland’s most impressive waterfalls and rugged natural landscapes. It’s a perfect place to stay if you want to experience authentic Iceland, away from the busy tourist attractions of the city. This log cabin style resort looks rustic and quaint on the outside, while the inside is lavish and boldly decorated. Each room is decorated in a different style, and they’re not afraid to go overboard with the decor. Rooms feature everything from antler chandeliers and bearskin rugs to black and white couches and penguin statues. But while the style is unique, the facilities are still elegant and luxurious, with spacious rooms, incredible views, and a lounge and restaurant on-site. The eastern region of Iceland is some of the country’s most rural and least-populated land. While you won’t find many of the city amenities of Reykjavik, it’ll be hard not to fall in love with this area. You’ll see magnificent mountains, gorgeous waterfalls, and incredible hiking along the Eastfjords, the region’s most popular destination. And of course, we have a compilation of the area’s most charming places to stay. There’s nothing more quaint than staying on a sheep farm in the heart of Iceland. The rooms are small but charming in this simple country house. But the real attraction here is the incredible views surrounding the house. The dining area features two walls of floor-to-ceiling windows offering up panoramic views of the fields and mountains. It’s hard not to fall in love with Iceland during a stay here! 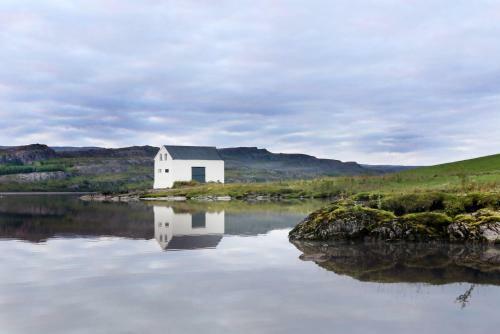 This modern hotel is conveniently located in the heart of Egilsstadir. The rooms are simple but comfortable and feature beautiful city views from large windows. It definitely has more of a luxury hotel feel for the price of a budget stay. The hotel’s restaurant serves gourmet local dishes, and the bar has a killer happy hour. Indoor and outdoor lounge areas add an extra level of comfort to the hotel. This hotel is gorgeous. The rooms are simple and minimally decorated, but they’re spacious and comfortable. The location is perfect and has the best of mountain views with a waterfront location. The hotel’s restaurant sits on a floating pier over the water. Stone and hardwood floors give the rooms a sleek feel, while beds and living areas exude all the comforts of home. The views here are truly unmatched. These individual cabins are nestled on the edge of the water with the sheer mountain faces rising up behind them. A truly tranquil spot to stay. The cottages are pretty tiny, but they’re cute and have everything you need. An added bonus of this spot: the hot tub boat. Yep, that’s right…an actual hot tub built into a boat. But don’t worry, the boat stays put on land! This hotel is right on the lake with a beautiful beach out front. The rooms here are cozy and clean with excellent views. The hotel features a stellar spa facility with a sauna and hot tubs. There’s an outdoor terrace area with an indoor lounge too for when the weather is cold. An extra bonus for cold days: the bathrooms have heated floors to keep you warm and cozy! Finally, we have the far north of Iceland. In this region, you’ll find the country’s expansive lava fields, snow-capped mountain peaks, bays full of local wildlife (you might even catch a glimpse of some whales! ), and incredible nature trails. This is the place to explore some of Iceland’s natural wonders. From quaint towns to rural farms, you’ll find a unique selection of accommodations here. This hostel is located in the heart of the charming town of Akureyri. Accommodations are simple but neat. The dorms have bunks while the twin rooms have two side-by-side beds instead. The hostel and restaurant are popular and the area always seems to be busy. Great spot to meet people and get a feel for the local nightlife, but not ideal if you’re wanting quiet or privacy. The interior of this hotel is modern and minimally decorated. The on-site restaurant serves up local delicacies, and there’s even a souvenir shop attached for any knick-knacks you might want to pick up. Views from the rooms are incredible, and the area is perfect for nature hikes and sightseeing. This rural resort is nestled on a real farm, with cows and sheep right outside. The place is charming and while the rooms aren’t huge, they’re still nice and boast beautiful views of the countryside. Gourmet local meals, including a full breakfast, are served at the Cowshed Cafe next to the resort. Accommodations are in pine cabins with a lovely, rustic atmosphere. This hotel in the center of Akureyri is really a step above. 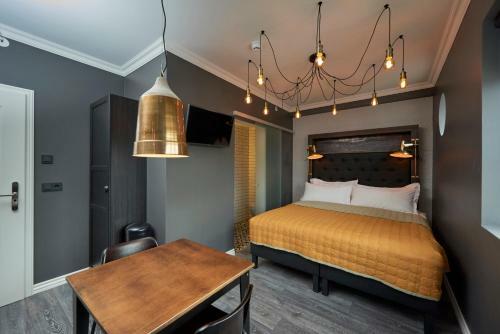 The rooms are a decent size, with floor-to-ceiling windows looking out onto the town’s main shopping area.There’s a restaurant and a bar on-site but if you prefer to eat out, there are tons of options within walking distance of the hotel. Guests receive discounts at a nearby spa center, which is a perfect option if you’re looking to add a little luxury relaxation to your trip! Interested in more articles on Iceland and the rest of Europe? Check out a few of our best ones!